The original Asus 3850, especially in the 512MB iteration, is a thoroughly respectable card. It's not going to break the bank, runs quiet and runs with a single-slot form factor. This twin set version with a whole 1GB graphics memory counters every single one of those plus points. The twin fan setup is incredibly loud, it's going to run you well over the £200 mark and is just as massive as the 3870X2. Performance-wise though, it does pretty well, batting just under the run rate of its older brother, the 3870x2. Then it's also only just a little less weighty on the wallet. You can pick up the faster card by spending only around £20 more, which ain't all that much. Still, Asus' multi-GPU loving won't end here. 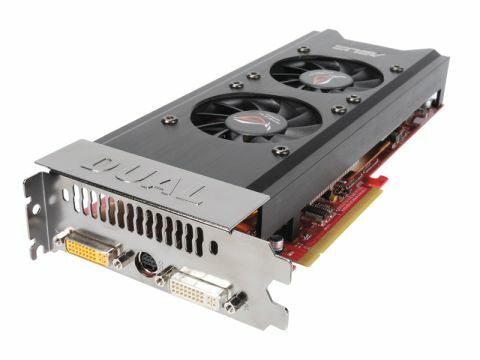 Pretty soon we'll see the first modular graphics cards doing the rounds, based on the Trinity MXM prototype. But really, shun this chunky fella.